Milk, cheese and butter were important staples of diet in the 19th Century. At the start of the 19th Century most milk was of poor quality. It was kept in uncovered churns and was contaminated by bacteria. To make the most profit from it some farmers could add water so the milk was very weak. In 1872 the Adulteration of Food Act was passed that helped to put a stop to this practice. 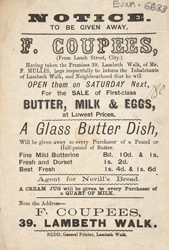 This shopkeeper is giving away a free gift of a glass butter dish to all those buying a pound or half pound of butter.